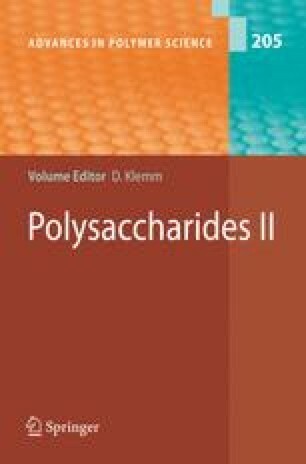 This review surveys advances in current studies of a variety of polymer compositional materials based on cellulose and related polysaccharides, the major studies being directed toward elaborate designs of environmentally conformable and/or biocompatible materials or highly functionalized material systems for many-faceted prospective applications. The scope covers graft copolymerization, miscible or compatible polymer blending and interpenetration, nanohybridization with inorganic minerals, surface modification of matrices, and mesoscopic self-assembling such as the formation of liquid crystals. In each individual case, it will be shown that cellulosic polysaccharides are microscopically incorporated and cooperatively interact with other adequate polymeric or inorganic ingredients to attain some functional objective. However, essential factors are the inherent characteristics of cellulosic polymers, such as the reactivity allowing hydroxyl substitution, hydrogen-bonding formability, complexing ability, semi-rigidity, chirality, etc. Material functionalities arousing interest include highly controllable biodegradability coupled with ease of processing for relatively common use as consumables, and further extensions for special uses, from mechanical and adsorptive performance to use in novel optical, electro-optical, and ion-conductive devices, etc. The author is greatly indebted to Professor S. Kobayashi of Kyoto University and to Professor D. Klemm of Friedrich-Schiller-Universität, Jena for their encouragement and helpful discussions as well as for their kind invitation to contribute to this special volume. The author also wishes to express his thanks to Drs. Y. Miyashita and Y. Teramoto, and to the graduate students R. Chiba and T. Ohno in my laboratory for their assistance in the preparation of this chapter.